What was supposed to be a moment of jubilation was turned into sadness for Air Peace, Nigeria's largest carrier, last Wednesday during the arrival of its latest Boeing 777 into Nigeria, as the aircraft was denied landing for several minutes, THISDAY has learnt. THISDAY gathered that the aircraft, which was supposed to touch down at the Murtala Muhammed International Airport (MMIA), Lagos by 3p.m from Dallas, the United States, was stopped from landing 30 minutes to its arrival by the Federal Airports Authority of Nigeria, (FAAN) over alleged "no parking space" at what is supposed to be the largest airport in Nigeria. The Airport Manager, Mrs. Victoria Shin-aba who was alleged to have refused to come out to resolve the problem, directed the airline to go and park the aircraft at Enugu or Port Harcourt airport. She was said to have also claimed that she was out of the office, even though FAAN workers said she was at the airport. Also based on her instruction, FAAN's Aviation Security (AVSEC) refused to allow journalists to go to the airside to cover the arrival of the aircraft until the Head of Communication of Air Peace, Chris Iwarah called the General Manager, Corporate of Affairs of FAAN, Mrs. Henrietta Yakubu who intervened. When contacted, FAAN alleged that Air Peace did not notify it on time about the arrival of the aircraft. But Iwarah told THISDAY that the aircraft was supposed to have arrived three days earlier, adding that the agency was aware of the delay and the subsequent arrival of the airplane that Wednesday. FAAN also complained to journalists that Air Peace had earlier brought Boeing 777 and parked them at the airport. 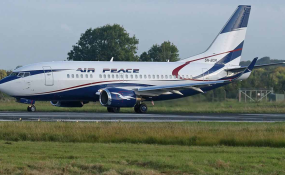 Iwarah also countered this claim, saying that the agency was aware that the aircraft were being prepared for international operations and were going through procedures with the Nigerian Civil Aviation Authority (NCAA) before they would be inducted as part of Air Peace fleet so that they would be used for international service. Iwarah also said the aircraft were not just parked there but were used for demonstration flight for several hours in order to meet NCAA regulation for the airline to conduct international operations. He disclosed that the demonstration flights took the aircraft to Sharja in United Arab Emirates, Johannesburg, Dakar, Senegal, Kano, Freetown, Port Harcourt, adding also that they are used everyday for training between Lagos and Abuja. THISDAY gathered that after negotiations between FAAN and Air Peace, the agency asked the airline to land the aircraft at the cargo section of the airport instead of the terminal where commercial passengers flights land and park. It took several hours of persuasion before the aircraft was allowed by FAAN to be moved to the passenger terminal and by then, the captain of the flight and his co-pilot had spent two and half hours in the aircraft after it had landed. Sources at Air Peace told THISDAY that the two pilots who were supposed to operate the aircraft and train Nigerians that would take over from them decided to leave the country immediately, saying that the airport authorities were against the airline, hence they did not feel safe staying in the country. When contacted, Yakubu said she was sure that the airport manager, Shin-aba did not say the airline should take the aircraft to the Enugu or Port Harcourt to park. She also denied that FAAN was being antagonistic to the airline, saying that the agency earns huge revenue from the indigenous carrier and would not have any reason to they take such an action. However, Iwarah said FAAN and other aviation agencies have always demanded that Nigerian airlines should increase their fleet, stressing that the Wednesday incident was an indication that if the existing airlines increase their fleet to 10 aircraft per airline, there would not be enough space to park them. "But it is unfortunate that FAAN could take that tone when there are some aircraft that have been parked there for months and years that are not put to use and they want to stop the arrival of our aircraft which we are actively using for international operations," Iwarah said. Former Director of Engineering, Medview Airline, Lukeman Animaseun, told THISDAY that FAAN show preference to international airlines because they pay their charges in foreign exchange. This, he said should not be the case because when Nigerian carriers operate outside Nigeria they also pay in foreign exchange. He urged domestic carriers to always pay their debts to the agency and other aviation agencies. "Other countries show preference for their local airlines but I understand that FAAN prefers international airlines because they pay in dollars but that is wrong. If Nigerian airlines operate outside the country they also pay in foreign exchange. So this should not be the case. But I call on domestic airlines to pay their debts to FAAN. I am aware that many of them owe the agency and other agencies. In this kind of business where you rely on revenues paid by your customers, FAAN should not look down on the organisations that are paying them," Animaseun said. Industry consultant and CEO of Belujane Konsult, Chris Aligbe, said FAAN should explain why it said that there would be no parking space for the aircraft, stressing that the agency must have reasons why it said so and "until it comes clear, it would be preposterous to talk about it." However, he noted that there should be a standard in industrial relations, which is determined by how "each side plays its own game". "These are all part of industrial relations and what I will call low level emotional intelligence. How you relate with them determines how they relate with you because everyone has his ego and if you don't know how to massage that ego it will determine how you are treated," he said.